Aarsun woods present to you the handmade wooden partition Screen / Room Divider in Mango Wood & MDF with fine finish.The unit is beautifully carved by our skilled artisans with traditional finish.As the partition are best way to separate your puja room from other area or it give more importance to your unused space.The wood we use in making partition are highly durable and free from fungus. As we are the manufacturers so customization are available as per the customer requirement.We provide free shipping across India.wooden Panel room dividers serve a dual purpose when added to a home’s interior. They are a practical addition along with adding to the decorative appeal of your home. The most widespread use of a panel room divider is for dividing interior space into smaller, individual sections. It can also be used for hiding awkward corners of the house or highly-cluttered sections. Smaller wooden dividers are often added for the purpose of embellishing the room and creating some extra storage space. Perfect to use as a room divider or privacy screen. Contemporary style. Accessorize any room in your home. Made from mango wood and MDF. Cappuccino finish. Assembly required. 20 in. W x 72 in. 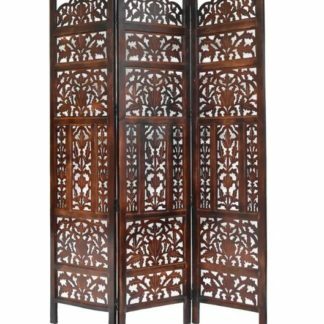 H. At a beautiful touch to your living space with this folding screen. Place it in your bedroom or living room, as a divider or simple accent piece. It is a definite eye-catcher.